With a history beginning in 1949 upon Red Ivy being sworn in as an attorney before the Oklahoma Supreme Court, the law firm of Ivy, Ratcliff & Chasteen, P.C. has over 60 years of experience zealously representing its clients in various fields of law. Although a general practice law firm, Ivy, Ratcliff & Chasteen, P.C. emphasizes civil and criminal litigation including the areas of family law, personal injury, probate, felonies and misdemeanors, guardianships, adoptions and property disputes. In addition to litigation, the firm handles real estate, estate planning and transactional work. From the beginning, Red Ivy’s legal heritage was destined with his father, Harley Ivy, and older brother James Harley Ivy practicing law in Red’s hometown of Waurika, Oklahoma. Red Ivy, known for his intense cross-examinations and quick-wit, became one of Oklahoma’s best-known court room advocates for those who wanted a fighter. An actual Golden Gloves and collegiate boxer, Red Ivy went toe to toe with some of the greatest legal adversaries in the state. Red won hundreds of jury and bench trials and was successful at the appellate level if not satisfied with the trial court decisions. After six years of legal experience with other firms, David K. Ratcliff joined Red Ivy in 1996, and April Chasteen joined the firm in 1998. Red Ivy’s family received his posthumously-granted 50-year pin from the Oklahoma Bar Association after Red’s unexpected death January 18, 1999. David K. Ratcliff and April Chasteen have honored Red Ivy’s fighting spirit in their diligent representation of their clients. Together, they have almost forty years of legal experience helping their clients achieve their goals. 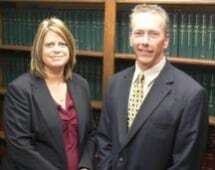 Whether it be helping victims of automobile accidents receive the damages and compensation they are entitled to, helping parents obtain custody or visitation with their children, or people prepare their estate plans for the future, David K. Ratcliff and April Chasteen have succeeded on behalf of their clients. Much of the success of Ivy, Ratcliff & Chasteen, P.C. is attributable to the excellent, experienced staff of legal assistants that help the firm's clients and attorneys move forward with their cases. The staff members at Ivy, Ratcliff & Chasteen, P.C. have over 60 years experience in the legal profession and are a vital asset to serving the legal needs of the firm.